Farley hasn’t met a food he doesn’t much care for (except for maybe cauliflower), and while we go out for Thai and Indian, and grab sushi whenever we can, I daresay my hubs is a comfort-food man. So on a night where I might have otherwise torn open a box of Fruit Loops (definitely meatless) and gone to town…..well….things have changed. I have a hubs to feed–and a non-vegetarian hubs at that! Grades are due for us tomorrow–we are both teachers in the same school–and that left little time for me to cultivate a “culinary extravaganza” for this evening. 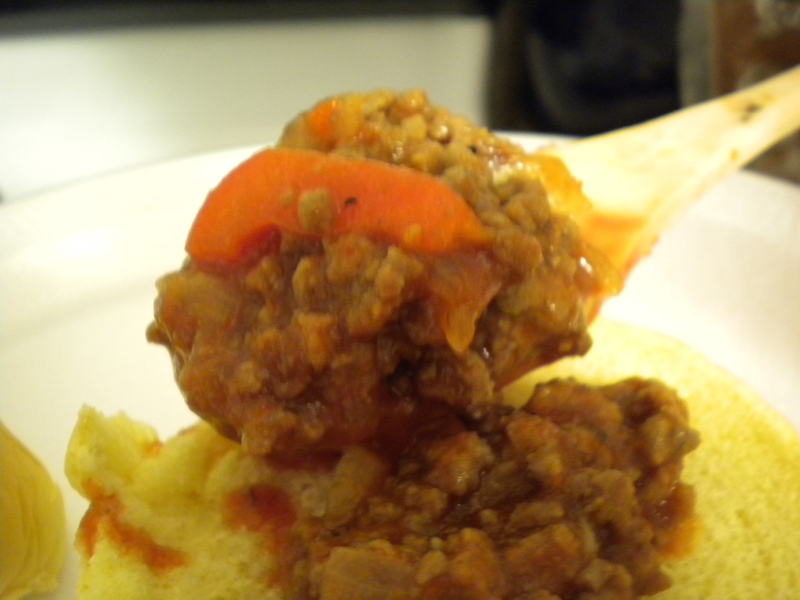 I stuck to my tasted-and-true: sloppy joes. It is definitely easy to pop open some pre-made, sodium-rich glop to shove onto your browned beef….but how appealing is that, really? Hamburger and sugar syrup do not belong together. I am on a mission tonight to break them up. Just call me the other woman, why don’t you. 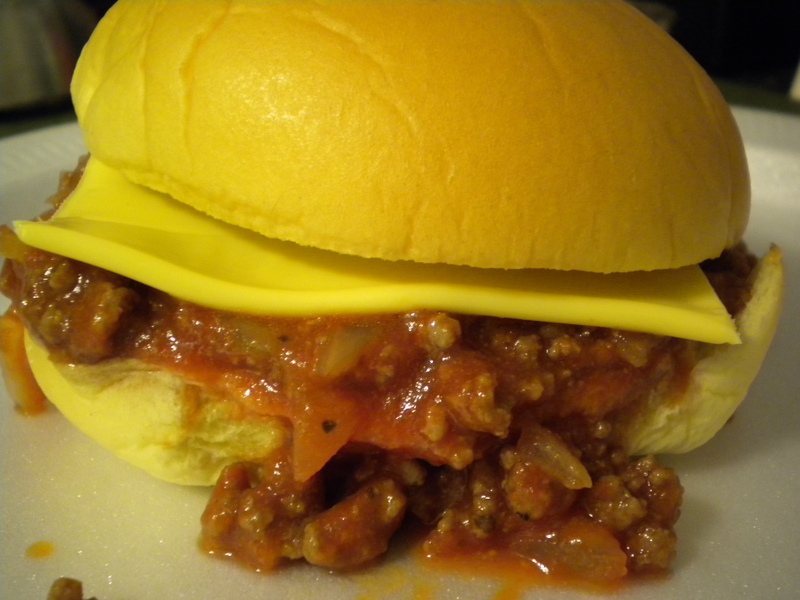 May I present to you an alternative , super FAST, DELICIOUS, HEALTHIER, and EASY way for you to make from-scratch sloppy joes that are definitely sloppy? Oh, and that won’t pickle your arteries with salt? (lovely). 1–Heat a large skillet over med-hi heat. Add 1 T olive oil and 1 1b. ground beef, and spread it around the pan to break up into teeny teeny pieces. 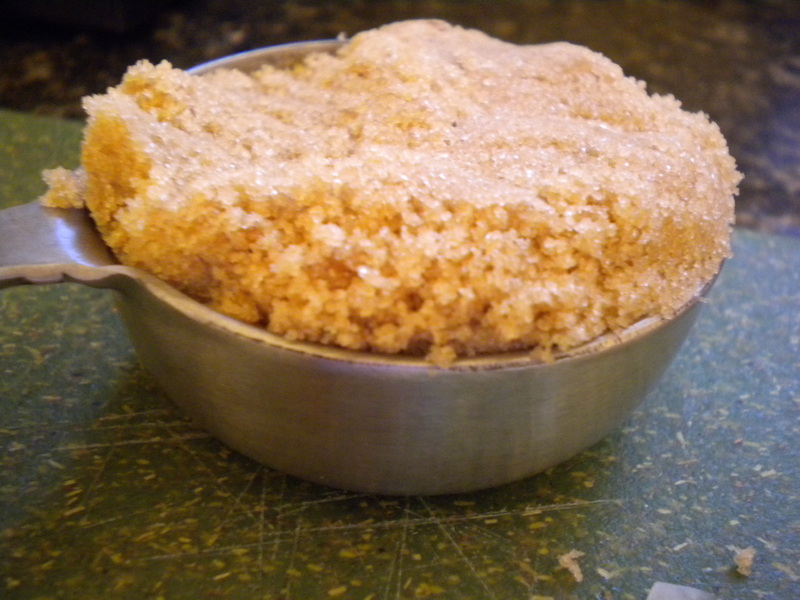 2– In another bowl, stir up 1/4 cup brown sugar and 2 1/2 tsp. 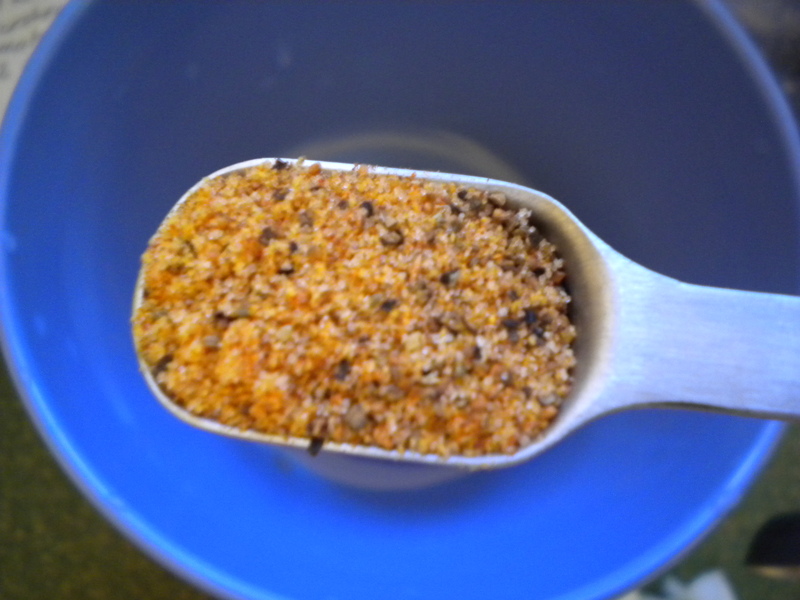 steak seasoning. Make sure to get rid of any sugar lumps! Add this to the meat mixture and combine. 3–When you see your meat is browning nicely, throw some onion (1 medium one chopped) and red pepper (1 small one, chopped) into the mix. Bring the heat down to medium and cook for about 5 minutes. 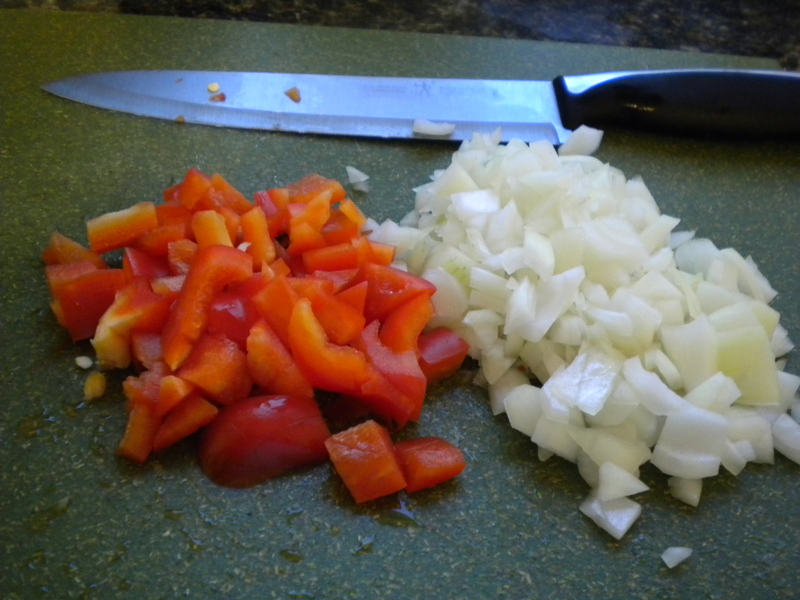 4–Stir in 1 T. red wine vinegar, 1 T. Worcestershire, 2 c. tomato sauce (NOT pasta sauce! Just tomato!) and 2 T. tomato paste. 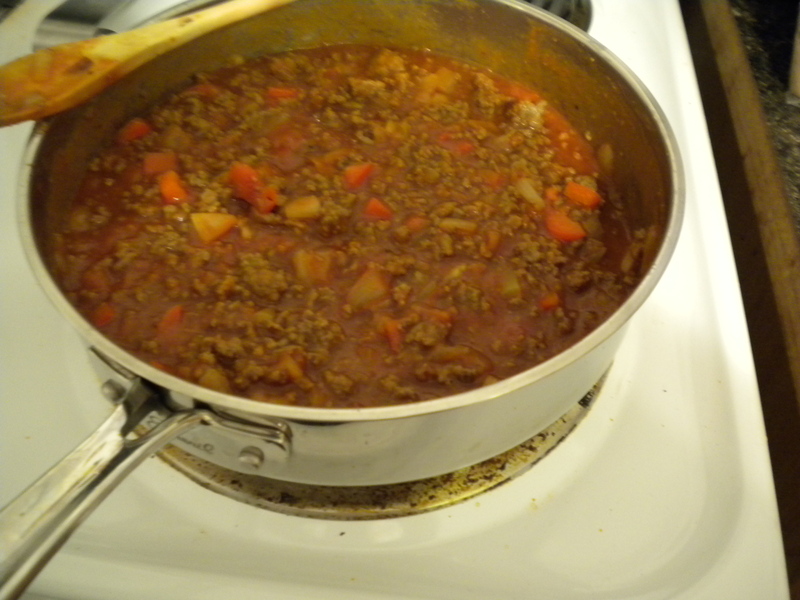 Stir it all up, reduce heat to simmer, and cook for 5 more minutes. Totally easy, totally weeknight do-able, totally yummy! 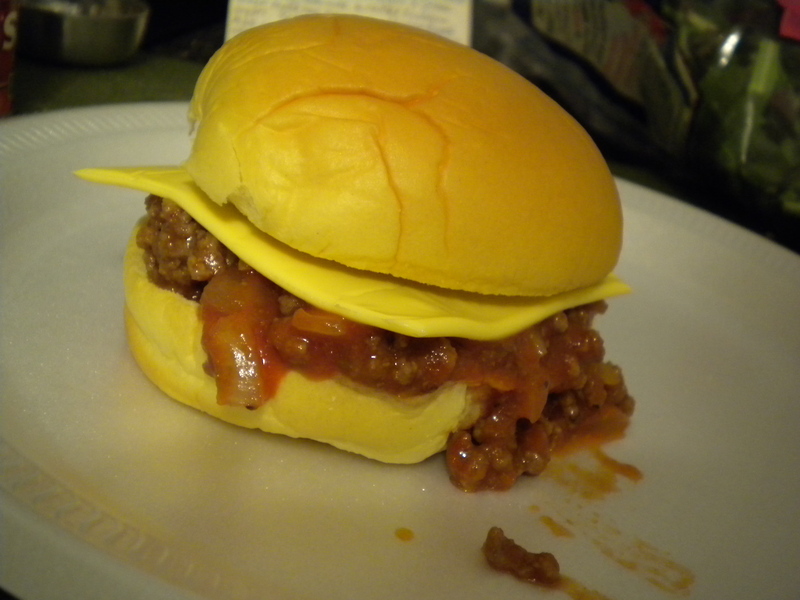 We spooned it up onto hamburger buns with a slice of cheese. (Moral of today’s story: you don’t need to mess to much with a sloppy joe). See you tomorrow for a slice of cinnamony baked goodness! Hey Charlotte! I love your posts and will probably try some of your recipes. Just curious on this one, if you used ground turkey it would be even healthier yet! I’ve found ground turkey really takes on the flavor of tomato based ingredients, and has the same satisfying texture of ground beef. Actually, ground turkey is what I usually use, but we had ground beef on hand so I chose to go the “classic” route, but for sure, ground turkey is even better for your health. Thanks for your comment and reminder! Yay Carrie! You absolutely need to show your MIL the Adam Sandler bit!! (Or at least show your hubs) 🙂 Let me know how your sloppy joes, slop, sloppy joes turn out! Twas sooooo good! I will make this again.